Versatile and portable, the MTB digital baby scale offers excellent value for paediatricians and other healthcare providers. 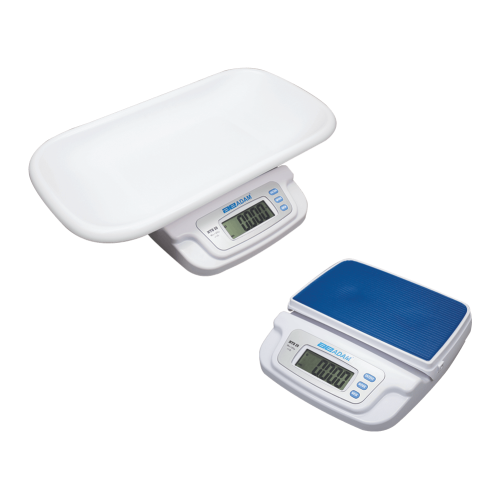 With a capacity of 20kg, this scale boasts the ability to weigh both newborn infants and toddlers on the same instrument. A cleverly designed ergonomic cradle provides comfortable support for babies and locks securely in place. The cradle removes easily to reveal a non-slip rubber mat underneath, simplifying the task of weighing toddlers. The MTB features quick start-up and easy operation, so minimal training is needed prior to use. Nurseries that look after newborns and toddlers may be required to track weight to ensure healthy development. The MTB doubles as an effective baby and toddler weighing scale through a detachable cradle. Medical professionals such as paediatricians that specialise in baby development often use weighing scales as a means to track whether a baby is growing as they should. Scales can detect signs of underdevelopment early, allowing paediatricians to look into dietary and development problems if necessary. Baby scales can also be used regularly around the home by parents that wish to track their baby's development independently.